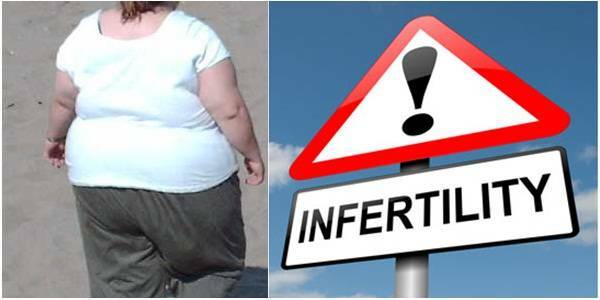 Reasons Why Obesity Can Cause Fertility Problems? Every couple wants to start their family planning, once they get settle down in their professional and personal life. Sometimes people avoid taking care of their health and this makes them overweight easily, when they just stay focused in their professional life. Being obese just doesn't make you look bad but it also gives invitation to heart problems and other health issues. Recent studies have shown that being obese can also reduce fertility of male and female both. So, now start doing exercise more cautiously to make you look good as well as to increase your fertility. If 30% of your body tissues are made up of fat, then you fall under the obese category. Improper diet, stress and unhealthy lifestyle are major reasons of obesity. As per one research, nearly 34% of young obese women, who are trying to conceive child, face one or other infertility problems. Besides it, 45% obese women are suffering from the lack of menstruation and ovulation (amenorrhoea) problem. Scientists have also found that men who are overweight have more chances to suffer from different fertility problems including lower sperm count. How does weight affect fertility? Obesity creates involuntary, psychological and interpersonal problems in both the partners as amount of fat present in your body is directly prepositional to production and concentration of several important hormones. These hormones play key role to maintain whole working of reproductive system of both men and women. So, it’s natural that once you become obese, normal production and concentration of hormones will change and you will suffer from different fertility problems. Reduction of sperm count in male and Polycystic Ovary Syndrome (PCOS) in females are most common fertility problem that are caused due to undesired alteration in the concentration of sexual hormones. Formation of ovarian cyst in women due to PCOS is main reason of infertility. If you have BMI more than 25 and also suffering from PCOS, then you should consult your doctor and start following healthy diet with proper exercise to lose some pounds. Men should also check out their sperm count, if they are fat and have fertility problems. As increase of 9 KG of weight in men can drastically decrease the sperm count by 10%. Some of the other signs that indicate the unwanted change in your reproduction system due to more weight are unwanted hair growth and Acanthosis (dark pigmentation in the folds and nape of neck). Some other main problems faced due to the excessive weight are irregular or infrequent menstrual cycles in female, increased infertility rate in men and women, few chances to get desired outcomes of fertility treatments, high risk of miscarriage in women. What are the complications that might woman face due to obesity during pregnancy? No doubt that obesity creates different fertility problems in both men and women. But if women stay obese during the pregnancy, then it creates different complications for both mother and child. Miscarriages: If some of the obese women get success in conceiving child, they might go through different difficulties in last stage of pregnancy. Most common situation seen in obese pregnant woman is miscarriage due to hypertension. Delivery problems: Obesity in an open door for different health issues such as type 2 diabetes, cardiovascular disorders, liver disorders and depression. All these problems have negative impact on both mother and infant during the pregnancy period. Normally obese pregnant women suffer from hypertension and gestational diabetes that induces different delivery problems. Health problems: If some how obese pregnant woman get lucky to deliver her infant, then due to increased level of obesity she might suffer from metabolic syndrome and cardiovascular disorders. What can be done to increase fertility in overweight person? Medical science research has come to conclusion that different fertility drugs and IVF treatment is less responsive on overweight women. It is main reason that IVF clinics force to reduce BMI of women before they actually start IVF process on woman who want to concieve child. So, it is must to lose some of the pounds to conceive a child. Woman must follow proper and multi-disciplinary diet and exercise plan to reduce her weight. It will also reduce the chances of chronic heart disease and other health issues. Obese women should start forum to talk on different reasons of infertility. If male partner is obese and that is the reason that couple could not conceive a child, then male partner should start shading pounds to resolve the problem.